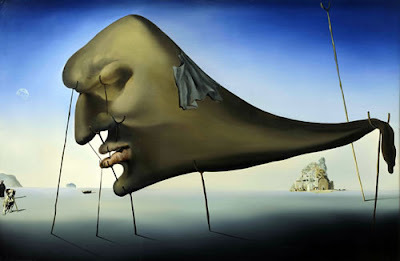 Salvador Dalí was born on May 11, 1904 in a small town in Barcelona, Spain known as Figueras. Dalí’s childhood was filled with private education and fits of megalomania. In fact, Dalí’s power-fuelled and extraordinarily violent infancy is now considered to be one of his primary inspirations. By being hypersensitive to his surroundings during his formative years, Dalí learned to transform the extremities—his terrors, his ecstasies, his world—into art. His Spanish heritage has also informed many of his pieces. Oftentimes, the rocky ravines of Catalan country and the sandy gulf of Rosas find their way into the background of Dalí’s paintings. Another influential aspect of Dalí’s childhood was the death of his older brother, another Salvador Dalí. At the age of five, Dalí established an internal dichotomy: he claimed he was the reincarnation of his brother; and with two Salvador Dalí’s came two, disparate sources of influence. In this way, even at an early age, Dalí recognized the significant impact that his surroundings would continue to have on both him and his artwork. Dalí’s paintings can fit into various stylistic moulds, including Impressionism, Pointillism, Futurism, Hyperrealism, Abstractionism, and predominantly, Surrealism. Dalí dabbled in each of these various visual styles of art as a student at the Real Academia de Bellas Artes in Madrid in 1922. The transition into this formal artistic education shortly followed the death of his mother, Felipa Domenech Ferrés. After leaving art school and Madrid, several years passed as Dalí fine-tuned his ability to put his paranoiac and extreme visions onto the canvas. Another external influence that held great importance in shaping Dalí’s work was fellow artist, Giorgio de Chirico. De Chirico made a large surrealist impression on Dalí as he pioneered the use of cavernous perspective, enigmatic shadows, and evocative imagery—each of which are now symbols of Dalí. One such painting of Dalí’s that alludes to de Chirico is his 1927 oil on wood panel painting, Apparatus and Hand. In Apparatus and Hand, Dalí’s sharp shadowing mirrors that of de Chirico. He thoughtfully positions the shadows to the left of their corresponding objects, and furthermore, the lines with which he creates these shadows are piquantly acute. Although such avant-garde and phantasmagorical imagery is not all that Dalí has created as an artist, I have chosen Dalí precisely for his dream-like and mystifying technique. As a psychology major, I have taken a particular interest in Dalí’s musings on Sigmund Freud. As a conducer of surrealist art, Dalí recognized that not every stroke or choppy procession of objects was a conscious decision. In fact, Dalí viewed his art as a twofold, Freudian-like process: an initial outpour of his subconscious followed by subsequent conscious reasoning and delusions with which to finish the work. Furthermore, Dalí has even claimed that he himself is the most surprised by what ends up on a canvas, further demonstrating the supposed critical potency that his subconscious has on his art. 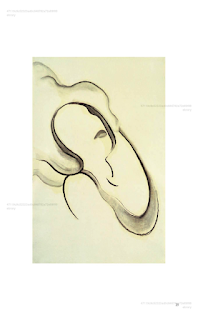 Sleep, a piece created by Dalí in 1937 is an oil painting on canvas that seemingly directly corresponded with his piqued interest in the father of psychoanalysis. 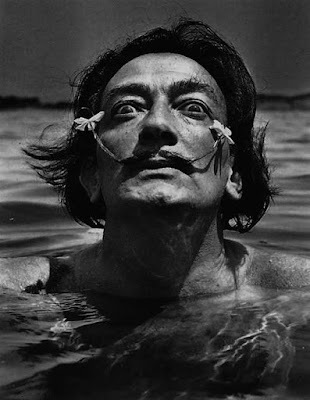 According to Dalí, “in order for sleep to be possible, a whole system of crutches in psychic equilibrium is essential. If only one were missing, one would wake and above all the little boat would disappear immediately” (Barnes, 2009). Dalí’s Sleep is itself a direct manifestation of this concept—a small boat can be discerned as emerging from the ocean’s horizon and the mountainous face is held upright, and thus lulled into sleep, by way of strategically placed stilts. From this, it is clear that Dalí’s Sleep is influenced by his surroundings and his unconscious ruminations. Moreover, in accordance with one of Freud’s many theories surrounding sleep, Dalí’s Sleep references the unconscious manifestations (perhaps unconscious needs or desires) that ultimately float into one’s subconscious during slumber as if on a tiny, elusive boat, that at any moment, can disappear with consciousness or wake. 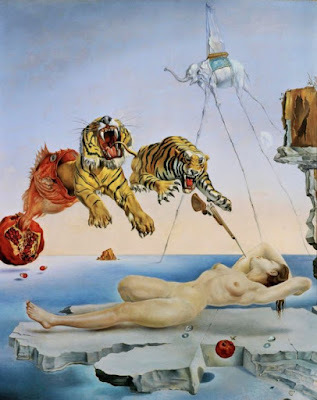 Another one of Dalí’s pieces that particularly intrigued me and ultimately prompted my decision to choose Dalí for this project is an oil on canvas painting created in 1944. The piece is named Dream Caused by the Flight of a Bee and features his primary muse (his wife Gala), arachnid-legged elephants, veracious cannibalistic tigers, a bursting pomegranate, a miniscule bumble bee, a gun, and more. Dream Caused by the Flight of a Bee is based on a dream that his wife had one night of a bee buzzing around a pomegranate fruit. While both the fruit and the bee make it into Dalí’s work, the primary focus of the image is his wife’s naked body, the long-legged water-walking elephant, and the fish-tiger compilation. 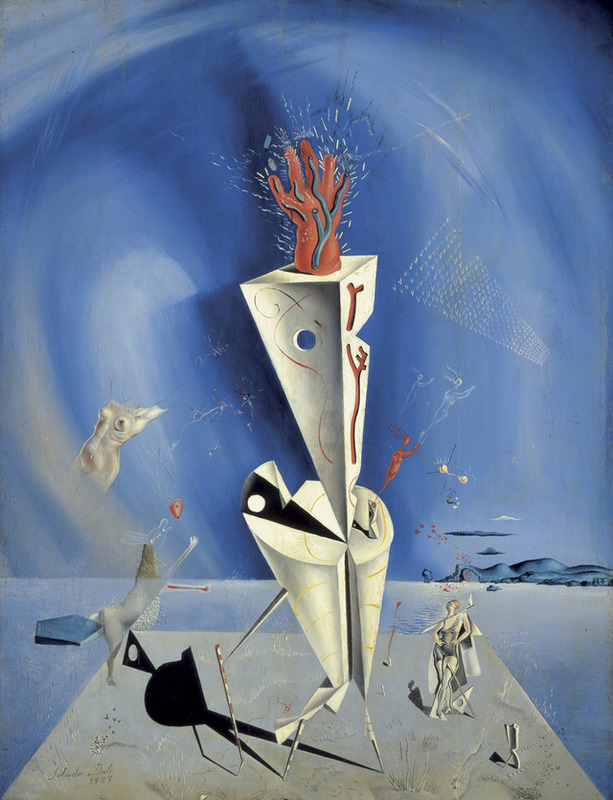 Like many of Dalí’s surrealist pieces, this painting features impossibly perplexing elements of reality that when combined, transport the viewer into a dream-like, fantastical alternate universe. Additionally, I perceived Freudian influences on this painting as well because each seemingly unconnected element suggests that the unconscious must be the glue piecing them all together. While I am unable to make sense of each and every element of this painting (beyond perhaps the Port Lligart backdrop seemingly stemming from Dalí’s Spanish heritage and his naked wife as a carnal muse), such inscrutable characteristics is what draws me to Dalí’s work in the first place. When viewing a Salvador Dalí piece, onlookers are transported from their immediate reality into a dream-like world, where reason is optional and possibilities are endless. Barnes, Rachel. Salvador Dali. London: Quercus, 2009. Print. Grenier, Catherine, and David Radzinowicz. Salvador Dalí: The Making of an Artist. Paris: Flammarion, 2012. Print. Soby, James Thrall. Salvador Dali. New York: Museum of Modern Art New York, 1946. Print. When Georgia went to Chicago, one of her teachers was Alon Bement . His teaching style was a bit unconventional but Georgia felt very inspired by him. He didn’t want students to just copy nature; he wanted them to use geometric shapes to learn the principles of design. He also heavily stressed the concept of the line. Georgia felt that this method had actually helped maintain her individualism. 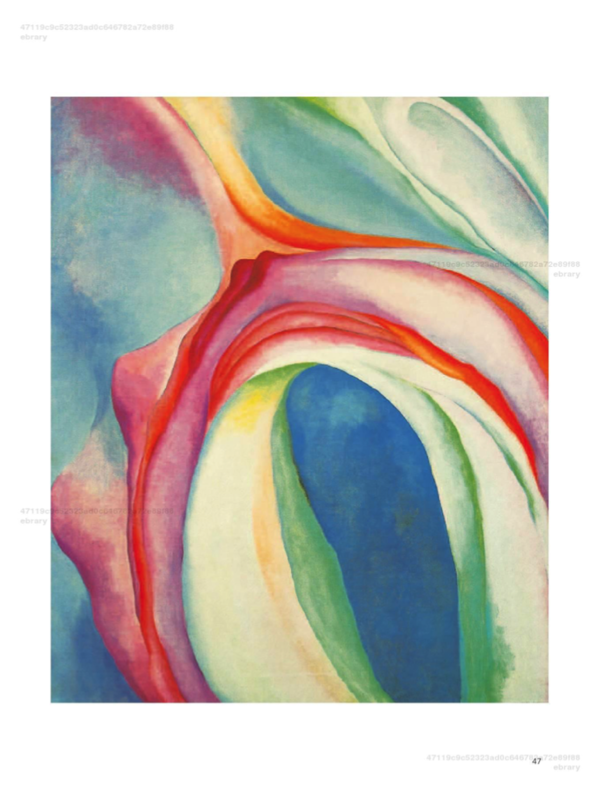 Abstraction IX shows how Bement’s methods allowed O’Keeffe to convey a simple impression of beauty just by line emphasis(Souter, 2011). O’KEEFFE, Georgia." Benezit Dictionary of Artists. Oxford Art Online. Oxford University Press. Web. 22 Sep. 2016. Souter, Gerry. 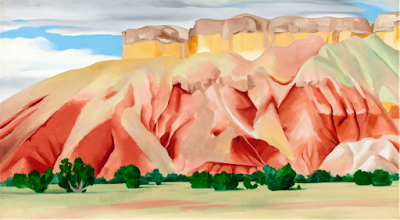 Great Masters : Georgia O'Keeffe. New York, US: Parkstone International, 2011. ProQuest ebrary. Web. 29 September 2016. Conveniently for me, we were overstaffed at Lilly Library last night during my shift. This meant there weren't even enough chairs at the front desk for me to sit in. So, when I disappeared for a bit, it wasn't an issue. I left the desk and browsed the NC labeled stacks for an artist to do this blog post on. I wanted to learn something new, so I intentionally avoided the names of artists I either knew or thought sounded familiar. I strolled through the stacks, pulling out books, flipping through them a bit, and placing them back on the shelves. This went on until I found a book with a drawing form that I've never given any thought to : modern sculpture. Of course I knew modern sculpture existed, but I had never see the drawn plans for such abstract forms. As I flipped through the book, I found it intriguing the way the drawing compositions were translated in the sculptures themselves ( which were included in photographs.) I then reread the spine of the book, The Drawings of Barbara Hepworth , took the book, as well as its neighboring book simply entitled Barbara Hepworth. According to that first book, Hepworth was "the greatest female sculptor in the History of Western art." Quite the introduction. But, it is true that in the twentieth century she was incredibly influential in the creation of British Modernism. She attended both the Leeds School of Art and the Royal College of Art, and went on to be a prolific producer of art in varying styles and medium. Yet, before these art schools, there were certainly factors in her life that would resurface in her later works. For example, her father was a surveyor. 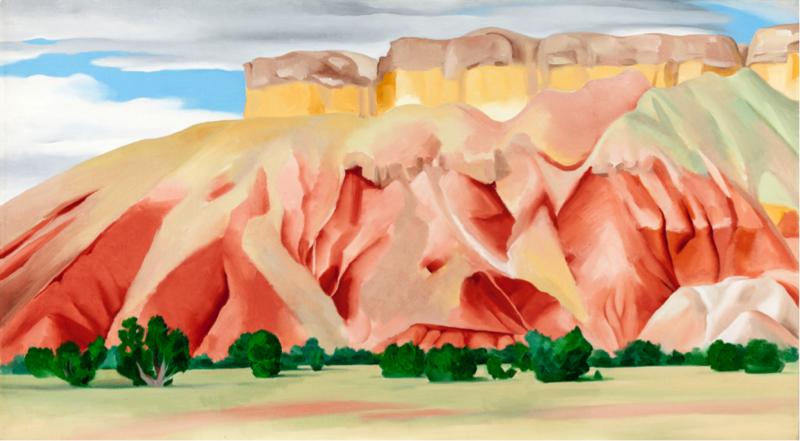 Between her father's drawings and a familiarity with math and numbers from childhood, her later works in the 1930s could have been founded in these earlier influences. It is this work of the 1930s that I saw when I first scanned the pages of the book. These two works are undoubtedly related, the sketch being called Form with Hole and the sculpture : Pierced Form. The drawing is simply pencil on paper, but is significant as it is one of Hepworth's "earliest almost-abstract drawings." This drawing over the next decade evolved into the drawing for sculpture. In a quote, she explains "If I didn’t have to cook, washup, nurse children ad infinitum, I should carve, carve, carve. The proof of this is in the drawings. They are not just a way of amusing myself nor are they experimental probings -- they are my sculptures born in the disguise of two dimensions." The two images above present the sculpture in both 2d and 3d. The drawing is entitled Oval Form No.2, and was done in pencil and gouache in 1942. A year later, Oval Sculpture, was completed, and is believed to be partly inspired by earlier drawings such as the one shown. In this drawing, there is an obvious emphasis on structure and geometry. It seems that the colored triangles are suspended by strings and curves reminiscent of the golden section. She explains such elements in the following quote "I used colour and strings …. the colour in the concavities plunged me into the depth of water, caves, or shadows deeper than the carved concavities themselves. The strings were the tension I felt between myself and the sea, the wind or the hills [author's emphasis]." By the end of this decade (1940s) she had moved on from focusing solely on sculpture and onto a different subject of study now know as The Hospital Drawings. It is this subject that the other book, Barbara Hepworth, focused on. The picture below was completed in 1948 using oil and pencil and is entitled The Child's Hand. When I first viewed the image, I perceived the work and technique of her sculpture drawings. The same bold curves can be seen in the sleeves of the surgeons, and triangles in their masks. My perceptions were confirmed in her own words : "I wanted to convey my feelings about the amazing structure of the inanimate hand and arm."